Plumber’s thread seal tape, also known as Teflon tape or polytetrafluoroethylene (PTFE), is thin, white and sold in rolls in hardware, plumbing and home improvement stores. 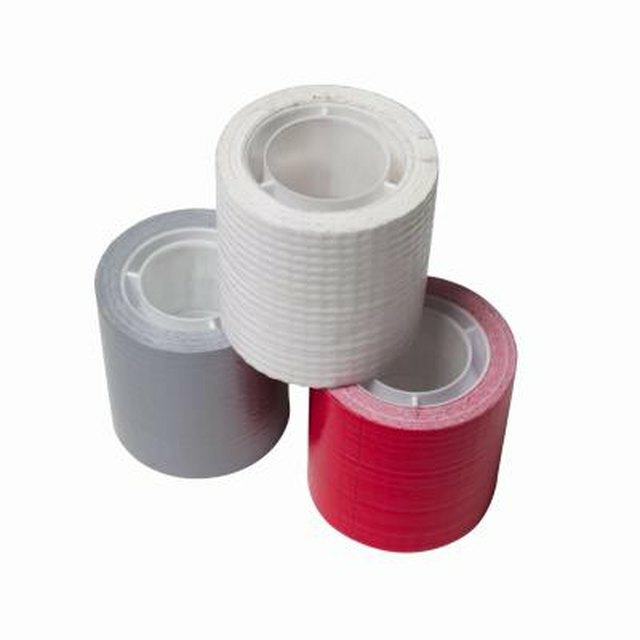 The tape acts as a lubricant during the pipe connecting process, creating a secure seal. It also helps prevent water leaks at threaded pipe joint connection points. Proper application of the plumber’s thread seal tape is necessary to prevent water pressure problems and clogs. Applying plumbing tape incorrectly can affect water pressure. Grip the end of the tape with your fingers. Press the end of the plumber’s thread seal tape against the pipe threads on the male end of the pipe, at a distance of 1/8 inch from the bottom of the pipe. Begin wrapping the plumber’s thread seal tape around the male end of the pipe in the same direction that the threads are going. Overlap ½ of the width of the plumber’s tape on each rotation, but do not overlap the tape end on the first pass. Continue to wrap the pipe threads with the tape, holding the plumber’s tape taught as you go. Cover all of the pipe threads with the tape while wrapping, slightly overlapping each row of tape as you proceed to the next. Stretch the tape on the final pass to tear it from the spool. Firmly press the torn end of the plumber’s thread seal tape against the pipe to secure. Do not use too much plumber’s tape. Two passes on the initial round and one to two passes over the remaining pipe threads (with a slight overlap) is all that is necessary. Too much tape on the pipe will affect the connection, possibly causing a leak. Never apply plumbing compound and plumbing tape together. The combination will not create an appropriate seal.